Everyone knows that dogs have sharp noses. But when it comes to helping people out, that sense of smell extends beyond sniffing out treats to rescue operations and training for drug raids. New evidence revealed that dogs can even detect hypoglycemic episodes–dangerous blood sugar drops–in patients with diabetes. A research team from the University of Bristol conducted a study on how trained dogs can detect hypoglycemia for those who have type 1 diabetes. Specifically, the dogs who took part in the study are trained in medical detection. To test the dogs’ sense of smell, the researchers gathered participants with type 1 diabetes who had dogs that have been trained and certified for medical detection. Some were even at an advanced level of certification. The dog breeds included Labradors, Golden Retrievers, a cross breed between a Labrador and a Golden Retriever, a Cocker Spaniel, a Yorkshire Terrier, a Collie mix, a Labradoodle, and a Lurcher. How Well Can Dogs Detect Blood Sugar Drops? Findings showed the dogs were able to alert their owners of a hypoglycemic episode during a 12-week period. The researchers cross-checked this with blood sampled from patients during the same time frame. The dogs picked up smell signals that are related to the low blood sugar in their owners. During that period, the dogs detected and warned patients who had hypoglycemic episodes in 83 percent of 4,000 cases. Lead researcher Nicola Rooney advised that success here needs two things: professional training and strong human partner relationships. “Our research shows a dog’s effectiveness is affected by the individual dog and its connection with its human partner,” said Rooney. Diabetes brings many complications, and developing hypoglycemia, or low blood sugar, can lead to several risks. Many times, patients are not aware that they have hypoglycemia because symptoms aren’t always easy to see. It’s hard to pinpoint exactly when your blood sugar level becomes too low unless you have it tested. When the level becomes very low, that’s when the more visible symptoms like shaking, sweating, and sometimes even seizures can occur. With a dog’s sharp sense of smell, they can recognize changes in a person’s blood. People experiencing hyperglycemic episodes (high blood sugar) will likely have fruity-smelling blood. Those with hypoglycemic episodes (low blood sugar) will have a different scent. There are several programs and organizations that train dogs to become medical assistants of this kind. These include the National Institute for Diabetic Alert Dogs and the Diabetic Alert Dog University. Certain breeds perform better in detecting diabetes-related scents, such as Labradors and Golden Retrievers. If you are planning to have a medical dog assist you or a loved one with diabetes, then it may be best to go with those breeds. 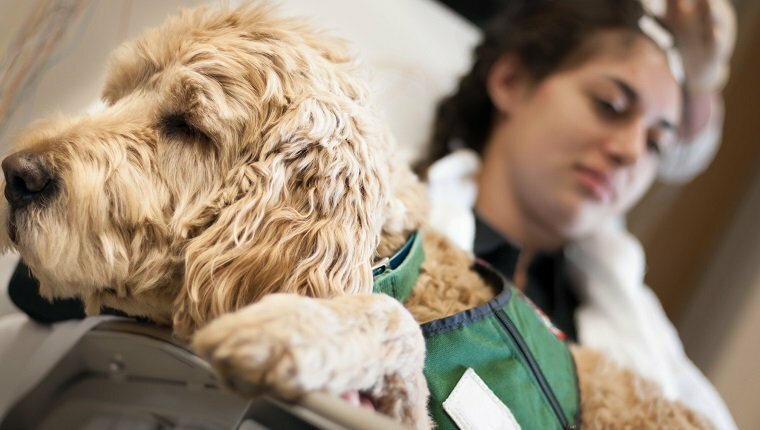 What do you think of these medical alert dogs? Do you think it’s good to have a pet companion who can detect diabetes-related developments within a patient? Let us know your thoughts below!